Risottos at our home are made on a regular basis. We really enjoy the diversity it offers as there are a multitude of ways one can serve this wonderful Italian staple. Once the basic risotto recipe is mastered, let the imagination then run wild to come up with unique and interesting sides or additions for the risotto. However, that has been the cause for vehement quarrels amongst famous cooks, star chefs and everyone else who likes to think they can cook. What is the right way to cook a risotto? How liquidy should a risotto be? Does one cook risotto in a closed or open pot? Is the continous stirring necessary or not? My tip to beginners and others, is go with your own flow. Do not let all these questions and studies drive you mad. If you are a stirrer then please watch over the risotto and stir frequently. I personally am not, I prefer checking on it regularly and stirring as desired. Risotto is basically a creamy rice dish with it's origins in Italy. Apparently the story goes back to 1541, when the magnificent Gothic cathedral, the Duomo di Milano, was being built, and a young apprentice by the name of Valerius was in charge of staining the decorated glass for the windows. Everybody was teasing him because he added saffron to the pigments to obtain a more brilliant color. He decided to return the joke and added saffron to the rice that was to be served at his master's wedding. The rice turned out so good and soon the idea was spread throughout the city and thus the risotto we know today was born. 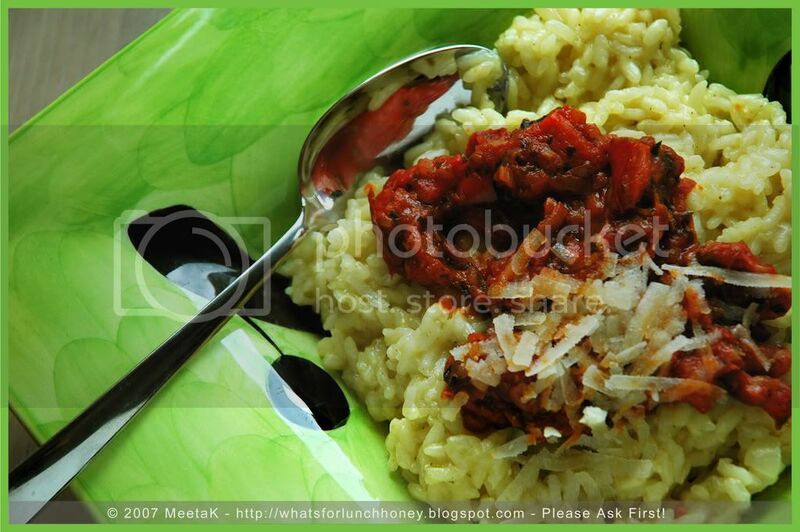 There are hundreds of different types of risottos, each one varying from the flavoring ingredient used. The broth - depending on the type of recipe and flavoring used, could be anything from beef, vegetable, chicken or fish. This is the basis of your risotto, so it is a good idea to use a strong flavored broth - whether homemade or store-bought. I like using an organic vegetable broth we get here that is powdered and comes in a jar. Adding liquid to it gives you a fantastic strong tasting broth. The flavoring ingredient - is what gives the risotto its final and distinguishing flavor. Normally this is added to the soffritto and can be anything from vegetables, tomato ragu, meat, fish, truffles and even fruit for a sweet risotto. The rice - is the main ingredient so buying a good variety is vital. The specific risotto rice are rich in starch and can absorb a considerable amount of cooking liquid. The three main types of risotto rice are Aroborio, Vialone Nano and Carnaroli. My own favorites are Aroborio on a regular basis and for special treats I will use the Carnaroli, which comes from the Piedmont region and has a wonderful and special taste. To finish off the risotto, butter and Parmigiano cheese is added to give it a full bodied aroma. The final consistency of the risotto should be thick and pasty, where the individual rice grains are are firm but stick together. By no means should the grains be soft - they still need to have a certain "bite" to them. For my own risotto dish I have used the Aroborio type of rice, which is supposedly a favorite of most Italian housewives. It's perfect for all kinds of risottos and my tip for those making risotto the first time. This risotto rice allows you to cook it al dente without much hassle and fuss. The flavoring ingredient red bell peppers, giving it a wonderful characteristic and flavor. In a heavy double-bottom skillet melt the butter and gently sauté the onions. Add the rice and allow to sauté until transparent. Stir to avoid the rice from sticking to the base of the skillet. Pour in th white wine and allow the liquid to simmer - uncovered. Stir occasionally (or frequently if you are a "stirrer"). Once the wine has been soaked up add about half of the vegetable broth and allow to simmer on medium heat. Stirring as desired. When the liquid has evaporated add the rest of the broth to the risotto and once again allow to simmer. It takes approximately 20 minutes until the rice reaches it's al dente consistency. If not, add some more liquid and continue to simmer and stir until the rice is cooked. Care must be taken not to over-cook it. Pre-heat the oven to 220 degrees C. Bake the bell peppers on a tray until the skins build bubbles and have browned. Revove from the oven and place a tea-towel over the peppers to allow them to sweat. Then remove the peel from top to bottom. Remove the seeds and coarsely dice the red peppers. In a pan heat up some oil and sauté the shallots until transparent. Add the peppers and continue sautéing for 2-3 minutes. Salt and pepper to taste. Pour in the wine, tomato and ajvar and simmer for 2-3 minutes. Sprinkle with herbs. 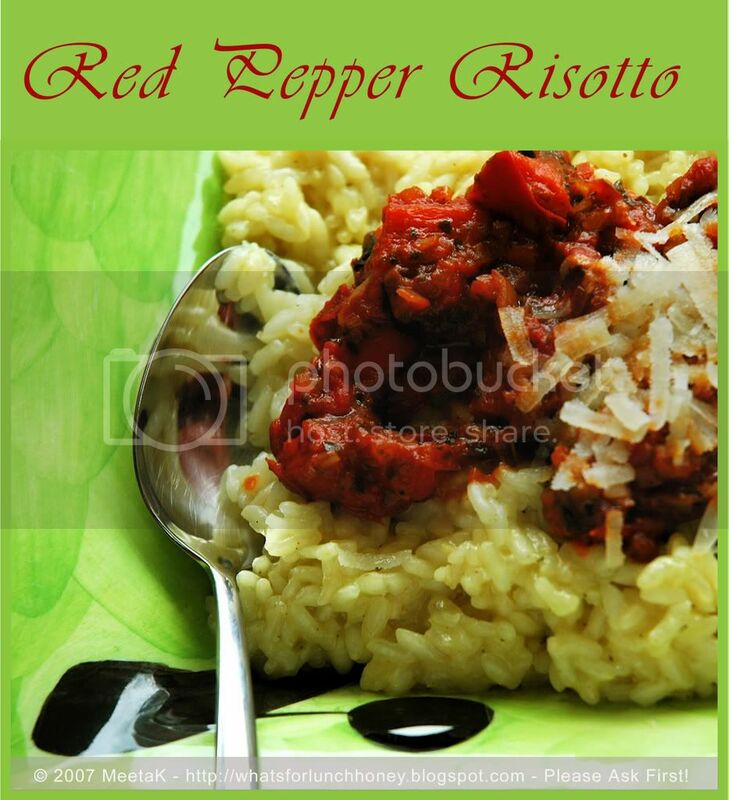 Serve the risotto on pre-warmed plates with the red pepper sauce on top. Sprinkle with the grated cheese. Do not wash the rice before cooking. Being an Indian, we normally wash our rice prior to cooking to remove access starch, which causes the rice to stick together. However, this is exactly what is desired in a risotto, so washing the rice will eliminate the starch that gives the risotto its texture. Choose the right type of rice for your risotto. If you are unsure go for the Aroborio - you cannot go wrong with this type. Use a large double-bottom skillet or pot when making risotto. This divides the heat equally throughout the pan cooking each grain to perfection. Normally the rule of the thumb is 75-100g of rice per serving. The butter and oil are to be warmed gently without browning them. The onions are also supposed to be sautéed gently until translucent - normally just about 2 minutes. The rice should not be cooked too long. If they are cooked too long in the oil/butter they could harden, which makes them unable to absorb the liquid as required. When the liquid/broth has been added, keep the heat to medium-low until the rice is fully cooked. Stir to prevent it from sticking to the bottom on the pot and add more liquid whenever the rice has absorbed the liquid. Risotto is never too mushy nor is it too hard - it has to be just al dente, so make sure you test for its readiness when its close to to fully cooked. Always serve the risotto on pre-warmed plates. This keeps the starches warm and pasty without solidifying the entire dish. A brilliant and easy way of having a comforting dinner. Risottos are so satisfying and I simply melt into its flavors. They are healthy, nutritious and perfect with a glass of chilled white wine. beautiful. I've never made risotto... I will try now. I have never made risotto before either, I don't know why!! It will definitely be done in the near future. Your recipe sounds and looks so wonderful! With Fall around the corner this is just perfect for this time of year! Risotto can be so intimidating when you first make it, but after that, it's wonderful and flexible. Anything tastes good in this creamy rice. My personal preference is for carnaroli rice, but it's not quite as easy to find in the grocery stores as the arborio, which is a beautiful rice, too. Great post Meeta! I love risotto and like you, not a fan of standing over it stirring continuously. I have never had risotto. But i think i should make it once. Meeta,lovely recipe! I am also a big fan of risotto. I love rice - a brazilian obsession. So risotto in a way becomes part of that love. Plus, as you say, it is so versatile, and we can have this great all in one dish. Tell me which Indian variety will be better suited...probably local short grains? I made risotto only once a very long time ago...with lots of substitutions I'm sure! Mmmmmmm ... Meeta that looks so good! Risotto and R.Bellpepper yummo !! That is certainly the most interesting risotto recipe I've ever seen. It's been ages since I've made risotto, this is a great reminder! Love making risotto and eating it, especially during cold winter days. Raaga, I really hope you give it a go - I have often "Indianized" a risotto recipe by adding daal and Indian spices to it. Deborah, Let me know when you try it out. If you need any help drop me an email and we can do it vie Google chat! It'll be fun. Pea, yes there is a nip in the air and I am already beginning to think about such warming foods! Jeena, thanks for the visit and I'll be coming around to yours soon! Lydia, you do not want to know what my very first attempt was like. I was a "stirrer" back then - but as I got better at it I took it all very easy. Carnaroli rice is also my faves but it's rather expensive and not so commonly available so that is why I use it on special occasions. Cynthia, for some it takes getting used to. Especially those you eat "normal" rice on a daily basis - they might get the feeling that it's not fully cooked. I hope I have the opportunity to change you mind one day! Nandita, YOU wil love it. I know that! If you need help drop me a line and I'll be glad to help out! HC, I am sure you will enjoy it. Valentina, it's wonderful how countries across the world use the same ingredient but prepare in so many different ways. I'd love to see a Brazilian version on your blog! Anita, so dear - Indian rice might not be too suitable for risotto. You need a short grained rice with a lot of starch content. Let me know if you cannot find it - I'll be glad to send you a packet. Ivonne, tingles your Italian tastebuds! Sara, LOL! Looking forward to your version! Tartelette, yet another dish on our list to make when we finally meet. Risotto was one of those dishes I obsessed about forever, then with some encouragement, I finally decided all my reading and research and obsessing would just have to work for me and I just did it. It does take just going with your flow! Love that creamy red pepper! I asked my wife what was for lunch, so she looked up your site, aas I said ahh look it up on the internet lol. We had Vegetarian Burgers but your chocolate Caramel Tart looks soooo good. Might have to try the Rissoto one day.